According to Daniel Kahneman and Amos Tversky's "Prospect Theory: An Analysis of Decision Under Risk," people give less weight to outcomes that are merely probable in comparison with outcomes that are obtained with certainty (see Example 5). 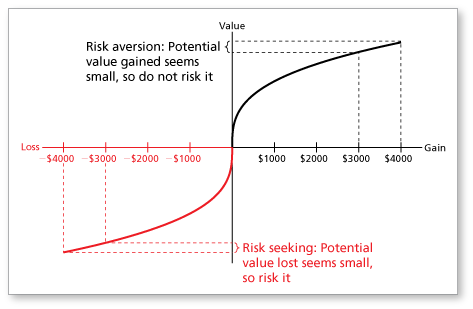 They called this tendency the certainty effect and concluded that it contributes to risk aversion in choices involving sure gains and to risk seeking in choices involving sure losses. This is depicted in the figure below using the scenario described in Example 5. Using the tools and calculators on Smart Money, you can assess your financial risks and gains from investments, savings, taxes, and more. Insurance on anything of value (house, car, jewelry, etc.) is an example of people fearing losses more than they value gains. They would rather pay to eliminate the chance of loss than keep the money or invest it. If a student expects a certain score on a test, his or her disappointment from scoring lower than expected would likely be greater than the pleasure gained from scoring higher than expected. I think this example is fascinating. 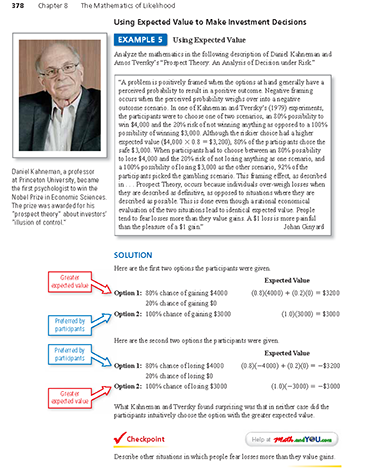 To me it shows that in some situations, people do not tend to make choices based on the best expected value.